Last week I had the thrill of having an article published in the Arkansas Democrat Gazette for the first time. The article was about consignment sales and ran as the lead story in the family section on Wednesday, September 29th. I’m not going to re-post the whole article here, but it ran with a sidebar that listed all the upcoming Fall sales across the state. I thought that might be useful, so I’m posting it. For those of you who have not experienced a children’s consignment sale, it’s a great way to score some excellent clothing, toys, and gear at great prices. It’s also a good place to make some money on all the stuff your kids are growing out of. It’s also very eco friendly, as you’re helping to recycle tons of products instead of consuming more new things. If you know of any other upcoming consignment sales, please leave a comment and I will add it to the list. Oops, We Baked Too Much – This rack can be found in or near the bakery in most grocery stores. In Kroger, it really is called the “Oops We Baked Too Much” rack. It is filled with bakery items that are about to go past their sell-by date. In most cases the markdowns are 50% or more. I stop here first and ferret out the good bread, cookies, etc. I freeze the bread until I need it. My picky husband did not notice that he was eating previously frozen bread until I asked him to get a loaf out of the freezer one day. 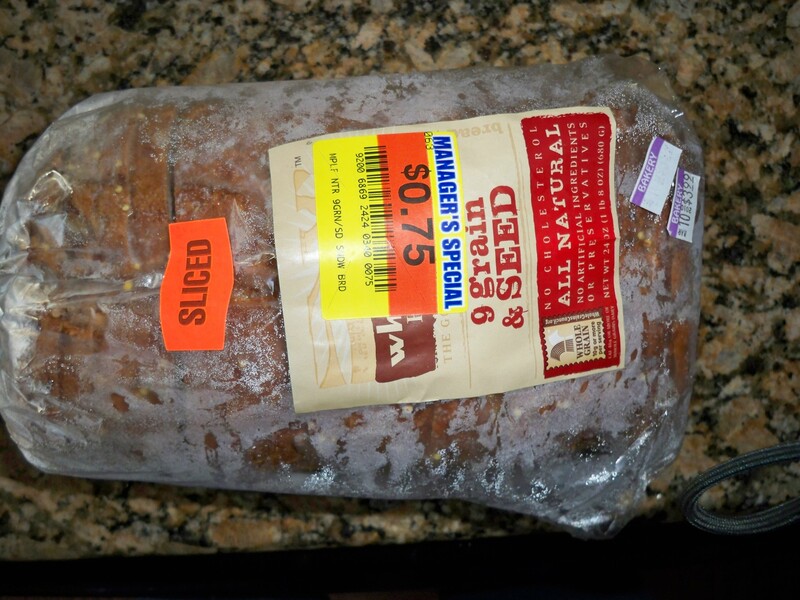 Generally the bread lasts 5 days after I buy it off of this rack. Manager’s Specials on Meat – I’ve mentioned this in a previous post, but I just recently realized that the marked down meat is all moved to one area of the refrigerator case. Makes it much easier to browse. Clear-Out Corner – I’ve also found that most stores have a clearance corner where they throw random items in a last-ditch effort to get rid of them. High discounts can be found, but you have to dig through a jumble of dry goods, personal care, and non-food-and-drug items. 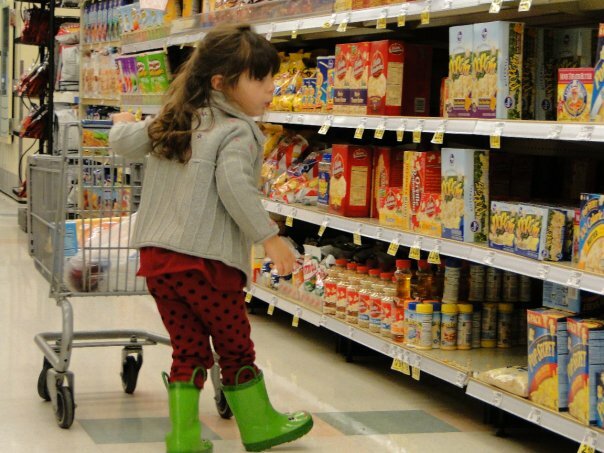 Look High and Low – In every aisle, higher priced items are placed at eye level. You’ll often find less expensive brands, off brands, and sale items placed on the lowest and highest shelves. Ten cents off Gas at Shell – This tip is specific to Kroger card holders in Arkansas. You can now use your Kroger card to save 10 cents per gallon at all Shell gas stations in the state. You do have to have at least 100 points ($1 spent in groceries = 1 point) accumulated on your Kroger card to use this card benefit. Store-Specific Digital Coupons – Many grocery chains are now featuring their own digital coupons on their websites. You register your store shopping card, click the coupons you want, and they are automatically loaded to your card. When you swipe your card at the register, they are automatically deducted from your total. Visit your store’s website to see if they have digital coupons, and go here for Kroger e-coupons. If you are a Target shopper and have a smart phone, you can sign up to have coupons sent directly to your phone. At the register, you bring up an image of the coupon, and the cashier scans it. Groupon.com – Groupon is not really grocery specific, but I think it deserves mention here as a great way to save money (as long as you only buy Groupons for things you normally use). Sign up for a Groupon account, and they will email you a city-specific deal every day. You decide whether you want to buy it or not. Savings are usually 50 to 65 percent and cover a wide range of goods and services: everything from car washes to trendy clothing boutiques have been featured here in Little Rock. If you don’t have access to a hard copy of the magazine, you can check out the electronic version on the Little Rock Family website. So, what’s your gpm? GPM? Gallons Per Minute! How many gallons per minute does your shower head spit out? If you don’t know, you might want to find out. It’s likely that it’s 2.5 gallons per minute or more. That’s what our shower heads were rated at, so our One Small Change for May is to replace our shower heads with low-flow versions, which use only 1.5 gpm. I have been wanting to do this since we moved in, but I really started focusing on it during the months of February and March, when Craig was gone every week for work, and our water usage dropped substantially (according to our meter readings on our water bill). Hubby loves his 10 minute morning showers. So, some simple math here. If Craig takes a 10 minute shower every day, and our new shower heads save us 1 gallon per minute, that’s 10 gallons a day, or 3,650 gallons per year. I probably take a 10 minute shower every other day, so that’s another 1,825 gallons saved. So total, we’re looking at saving approximately 5,475 gallons of water per year. Based on our water bill, we pay approximately $0.72 per gallon (including the sewer fee, which is based off of how much water you use), so switching our shower heads will save us $39.15 per year. 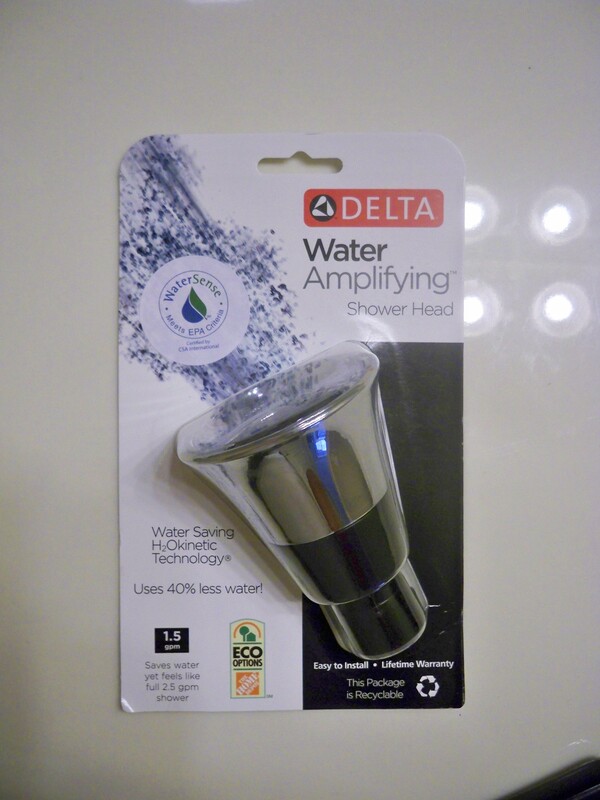 We paid $14 and $20 for our two new low-flow shower heads, so our total cost is $34. This first year, we’ll come out $5 ahead in our pockets, not to mention the value of conservation itself, and of teaching these concepts to our children. It should be noted here that we are on the low end of the spectrum of water usage, averaging 400 cubic feet of water per month. According to Central Arkansas Water, the average family of four uses 800 cubic feet of water per month! So, the average family would stand to save a lot more money by installing low flow shower heads than we will. Above is our old 2.5gpm shower head. Above is Craig’s new 1.5 gpm shower head. As you can see, the spray style is completely different on these two shower heads, and when I first saw the videos, I was a little concerned that Craig would not like the new style of spray. He said that he actually prefers it, as it provides MORE water pressure than the old shower head. Another statement that I hear about low flow shower heads is that people are concerned about the installation process. So, here’s a video of Craig installing the new shower head, one handed while holding the camera in the other hand, in less than a minute and fifteen seconds. Low flow shower heads come in many different styles, ranging from the basic model that Craig installed which you can likely purchase at your local home improvement store, to higher priced heads with massage settings, “rainstorm” spray, and whatever else you might require. I have a somewhat fancier low flow shower head on order from Amazon, so we’ll post video of it as soon as it gets here. Dasani is a brand of water bottled by Coca-Cola. I did a little research into the origins of the word Dasani and found that it originates from the Coca-Cola marketing team. There is no definition for it, although one exec tried to insinuate that the word Dasani conjured a “Roman God of Water”. For me, though, Dasani conjures visions of home, of my kids playing in the bathtub, of my sweaty yard man (hubby) drinking from the water hose, and even, *gasp* of me doing the dishes. You see, Dasani is bottled here in Little Rock. From tap water. Sure, they filter it (so do I, with a Brita pitcher), and they add some salt and potassium chloride (you know, the stuff in the chemical cocktail used for lethal injections) to it for taste, but it’s essentially bottled tap water, bargain priced at $1.50 per 20 ounces. So, it’s not quite champagne, but if I want to get my yuppie on, I can boast that I bathe my children and wash my dishes in Dasani (without the salt and the criminal-killer). On the other hand, on the rare occasion when I am caught somewhere without my reusable water bottle or with a whiny, thirsty child with no sippy cup, I feel like a hypocrite buying a blue-labeled bottle. As soon as I open the cooler, I know there’s a big blue light flashing above my head as I make my way to the checkout and the PA blares the announcement “Attention shoppers, we have a compromised tree-hugger making her way to checkout number seven!” But I still have to do it sometimes. Can you find your favorite brand? So, my point here, mostly, is that the word Dasani is about as valuable as the product it’s stamped on: a definition-less word for a re-styled, up-saled product, as are MANY of the bottled waters you find on store shelves. So, think twice before you reach for that fancy bottled water. Also, my blue “compromised tree-hugger” light will go off again if I don’t point out the other problem with bottled water. I know you already know what it is, but I have to say it anyway. 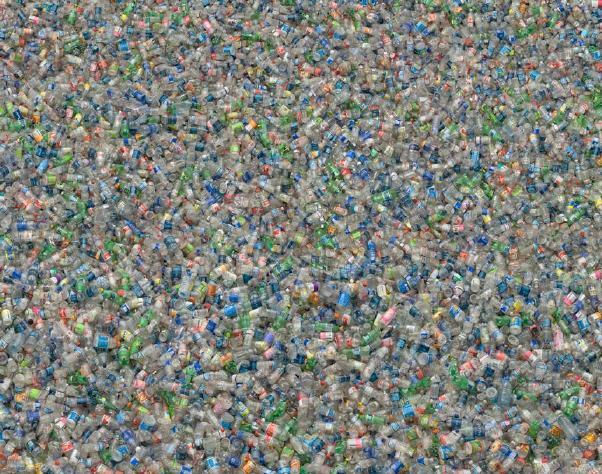 Americans alone throw away 2.5 million plastic bottles every hour. If you like water on the go, get your own container and use it, use it, use it, but don’t throw it away. In fact, if you’re hell-bent on supporting the local (Arkansas) contained water industry, I’ll recommend CynerGreen: a local, family run company whose mission is “saving the world, one bottle at a time.” In the long run, it’ll save you money and it’ll save your kids from having to live amidst heaps of plastic. In honor of Earth Day, my TWT posts will center on energy and “green” concepts this month. kWh stands for Kilowatt Hour, which is the measure of energy used by your electric company to figure your bill. A kilowatt hour is equivalent to using 1000 watts of electricity in one hour. This lightbulb only uses 11 watts, compared to a normal 100 watt bulb. You can figure how many kilowatt hours an electrical appliance uses by multiplying its wattage by the amount of time you are using it, and dividing by 1000. So, for example, (caution! english major doing math here!) 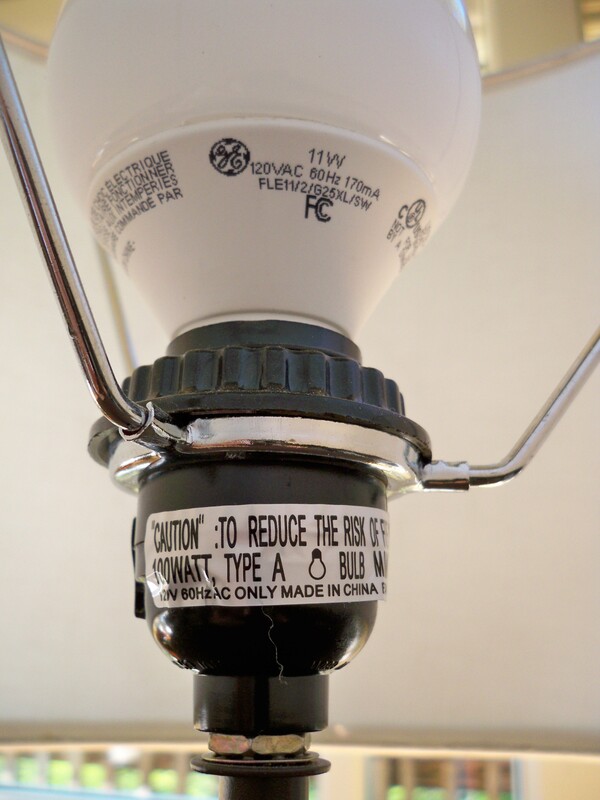 if you have a 100 watt light bulb in your lamp, and you have the lamp on for one hour, you use 0.1 kWh of electricity. If you keep that same lamp on for 10 hours, you’ve used 1 kWh. You can use this simple equation to figure out the electrical usage of many of the small appliances in your home, which are usually labeled with their wattage rating. Here in Central Arkansas, a kilowatt hour costs about 12 cents after taxes and fees. You can figure out your cost per kWh by looking at your energy bill. Divide your total bill cost by the amount of kWh used, and you’ll have your per kWh cost. So, you can save a substantial amount of money by decreasing the number of kilowatt hours you are using in your home. Do you know what the biggest energy user in your entire house is? Your refrigerator! Obviously you need to use your fridge, and it has to be plugged in all the time, but you can reduce energy use by turning the temperature up to a medium setting in your fridge. If you have two refrigerators, and your last name is not Gosselin or Duggar, GET RID of ONE! If you are looking to buy a new refrigerator, pay close attention to the energy use ratings. Look for the Energy Star logo, and avoid the side-by-side models, which are the least efficient. The second biggest energy sucker? Your clothes dryer. Now that the weather is getting nice, you can easily reduce your costs of drying clothes – the sun is free, and has many benefits that you can read about in my previous post, Ode to my Clothes Line. And finally, don’t forget the little guys. 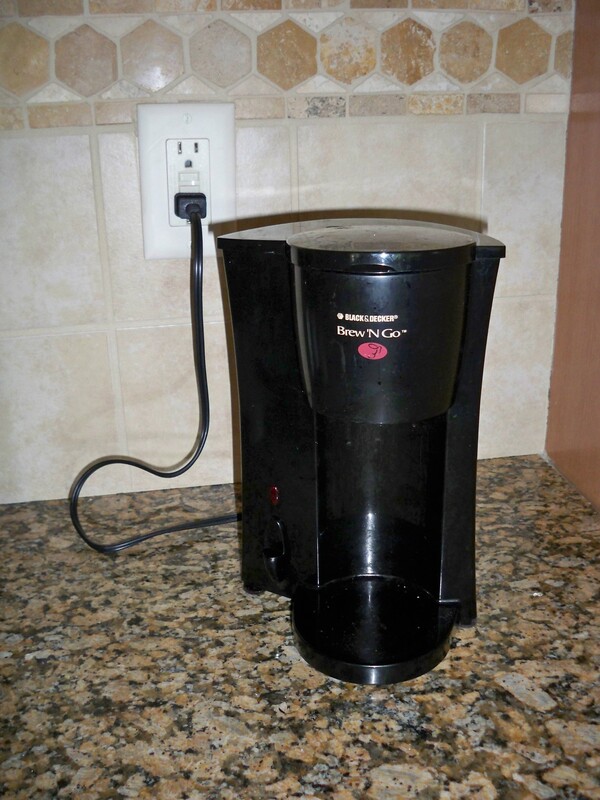 Even when they are not in use, small appliances like toasters, coffee makers, phone chargers, and hair dryers still pull wattage out of your electrical sockets. If you start unplugging five of these small appliances when you’re not using them, you’ll save enough money each week to buy yourself a latte. What can you do in your house to decrease your watts? Do you have questions about other energy or earth-friendly concepts? Let me know and I will do my best to address them! At least, not all the time. Like all habit-altering, budget-affecting decisions, delving into buying organic produce for your family can be overwhelming. I thought these two lists might help. You’ll have the greatest impact, ecologically and healthfully, if you try to buy produce from the first list organically. The second list is a few items for you to cross off of your worry list. Organic peaches sometimes get holes in them...from your kids nibbling on them when you're not looking.